Winter is here and it’s my favorite running season! It’s hard to believe that just last year, I dreaded running in the winter and made excuses to not do it. This year, I’m completely loving it. In fact, I’m consistently averaging 40+ miles a week, the most I’ve done since I started running. I still struggle to get out on those extra frigid days but with the right preparations, it turns into a great experience. Here’s why. As if completing a marathon wasn’t badass enough, toughing it out through the winter makes me feel even stronger! It boosts my confidence as an athlete and prepares me to take on any challenge. While everyone else is hibernating, it’s great to be out on those crispy days and train towards my goals. It takes a lot of guts to gear up and brave the cold weather but every single time I finish my run, I feel like a superhero and I love it. Running during the summer is the worst because I struggle to keep a good pace even for my recovery runs. Now, all my runs are much faster in the winter. Even though the winter days are shorter, this weather is more ideal for training because my body isn’t working quite as hard to stay cool. That said, if it gets really cold, I don’t concern myself with pace. If I need a workout done in the frigid weather, I always go by effort, rather than my speed. Since I’m faster during the winter, I get my best race PRs when it’s cold. The logistics of winter racing can be a pain to deal with but there’s nothing that replaces the feeling of satisfaction when I’m dropping my average mile time. I’m always trying to take advantage of winter racing for those personal bests because when spring and summer rolls around, I won’t be seeing those fast paces for a while. Get ’em while it’s cold, right? I really enjoy the process of using the first couple of miles on a run to get my body warmed up. Summer is the worst because I would be drenched in sweat before I even take my first step. Starting out relatively cold makes it less of a drag to keep running those miles and ending a cold run in sweat feels like a huge accomplishment. I just need to make sure that I head to a warm place right after because once I stop, the chill is going to catch up to me. Training and racing through the winter helps build my tolerance for pain, both physically and emotionally. I’m less afraid of challenging situations and feel as though I can conquer anything, on and off the road. When it comes to race day and circumstances are less than ideal, I still come prepared to brace the worst. Plus, if I willingly suffer through my winter runs, the struggles in life that I don’t sign up for aren’t as scary as they could be. I love uninterrupted runs. Going out to Central Park when there are fewer people roaming around makes it easier to focus on running. During the summer, there are so many people out there and it was hard to run freely because I had to be cautious of people walking, running and biking in many directions. Now that it’s cold, there are only serious athletes (and brave tourists) out there. It’s truly a peaceful experience to run in the winter. I hang out on Running Warehouse way more than I’d like to admit. Having a lot of gear makes me excited about running so I don’t see it as a downfall (although my wallet would like to argue otherwise). Proper gear makes all the difference in the world and winter running is more enjoyable when I’m prepared. I usually layer up, top and bottom, and wear a windbreaker shell (Asics Storm Shelter Jacket) with thermal gloves and wool socks. It works! The best part of maintaining my fitness through winter is that when it finally turns into spring, I’ll be in phenomenal shape! 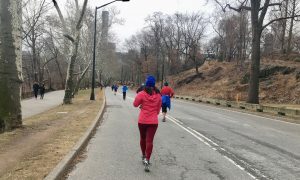 I eat a lot during the winter (I mean, I eat a lot all year) so it’s especially important for me to continue running and keep the extra pounds off my body. I also have an automatic head start on looking great for the summer. I love sporting my crop tops in the summer and I can’t wear those if I’m not in decent shape.